This game introduced the sniper mode. Actually, it's not an FPS because one sees Kurt Hectic, the game's hero, from the third person (from the back). However, in contrast to competitors like Tomb Raider, the designers made it so that the character's figure never covers the field of vision and thus doesn't lead to frustration. 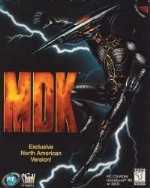 However historically valuable MDK is on account of the sniper mode which was used here for the first time (only while standing still, for the exact zoom function to work) and the 3D shooter scene was forever changed. The game tells the story of its protagonist, Kurt Hectic and his attempts to rescue Earth from an alien invasion of gigantic strip mining city-vehicles named 'Minecrawlers', which are not only removing all of earth's natural resources but are also flattening any people and cities that get in their way. The game combined fast action with fully 3D rendered, state-of-the-art (for the time) graphics and a warped sense of humour. In addition to the standard run-and-gun/sniper modes, there are a few mini-games in MDK. All levels start out with the atmospheric re-entry with Kurt skydiving from the Jim Dandy to the Minecrawler below. The Minecrawler fires a radar (a green cone) which if touched triggers the launch of anti-air missiles, which must be dodged. Dr. Hawkins also sends down weapons at this point which (if collected) are added to Kurt's level inventory. While some levels have a bombing run, boarding a glider and dropping iron bombs on enemies. This clears the enemies far easier than would be on foot and often garners extra weapons. There are also a few special game modes in different levels. One level has snowboarding sequences where Kurt must navigate obstacles while destroying enemies along the way. In another level, Kurt must disguise himself as a sentry robot to deceive guards.